Event risks are rare, but they can impact markets harshly. 9/11 being an obvious example. Unpredictable, unforeseen. “Stuff happens” Donald Rumsfeld once opined about events surrounding the Iraq war. But some event risk can be brewing for a long time. People know it’s out there, but it’s unquantifiable, it’s virtually impossible to time. A key reason is that one can never be sure of the outcome, the implications and more importantly from a market’s perspective: The reaction once the event unfolds. For over a year the Mueller investigation has been under way. Several people have been indicted/convicted sent to jail. Markets have largely ignored the Mueller investigation up until now, but that may be about to change. Why? Because there are signs that the investigation may be moving to a different, and perhaps more market impacting phase: Moving closer to the president and perhaps his family directly. I won’t bother commenting on the merits of the investigation nor will I opine about the outcome or its implications. There’s no point as everyone will have their own opinion and I have no crystal ball on how this will unfold. However, should the investigation move into a phase whereby the president himself or his family are directly implicated, then markets may react not as calmly as during previous indictments. In terms of market precedence there is really only a sample size of one, and that is the Nixon Watergate scandal that has been beaten to death in the opinion columns I’m sure. On key indictments days or high political resignations markets may react poorly, very poorly indeed. While gridlock may be preferred by markets, vast political uncertainty is not as it bleeds into confidence. And waning confidence breeds more waning confidence and before you know it you’re in a bear market. 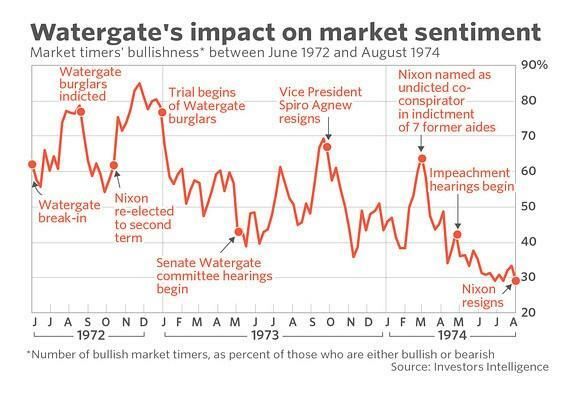 From the time of Nixon’s re-election to his resignation markets dropped 29%. It was a wild roller coaster ride with ripping rallies and steep sell-offs, but all within a downward trend that lasted until the event concluded. 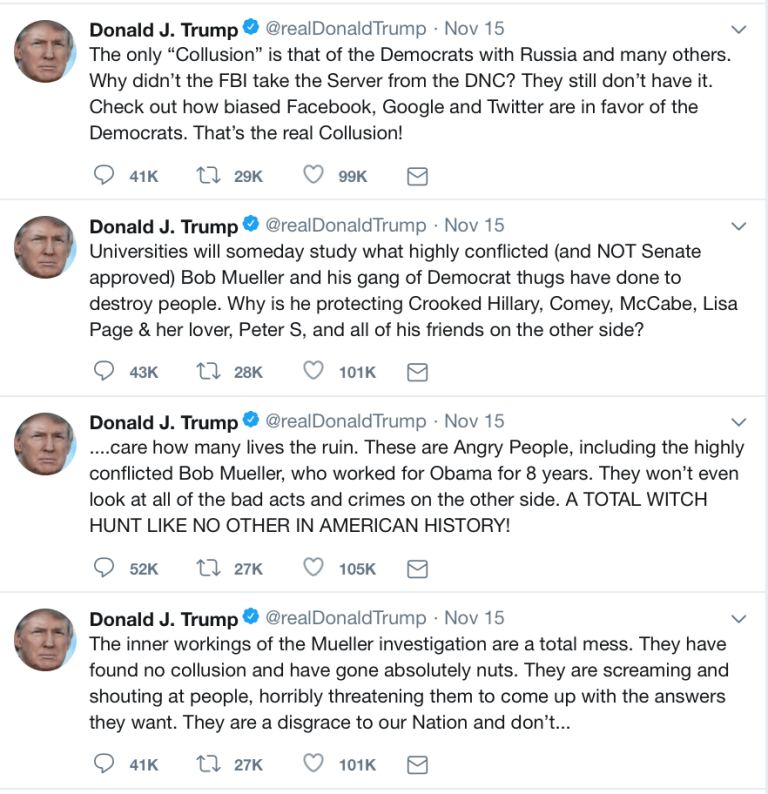 Did Trump send out his tweets because of a new found urgency in regards to the Mueller investigation? I can’t say. Markets are currently still working through the fallout from the October correction and a loss confidence is already permeating the action. 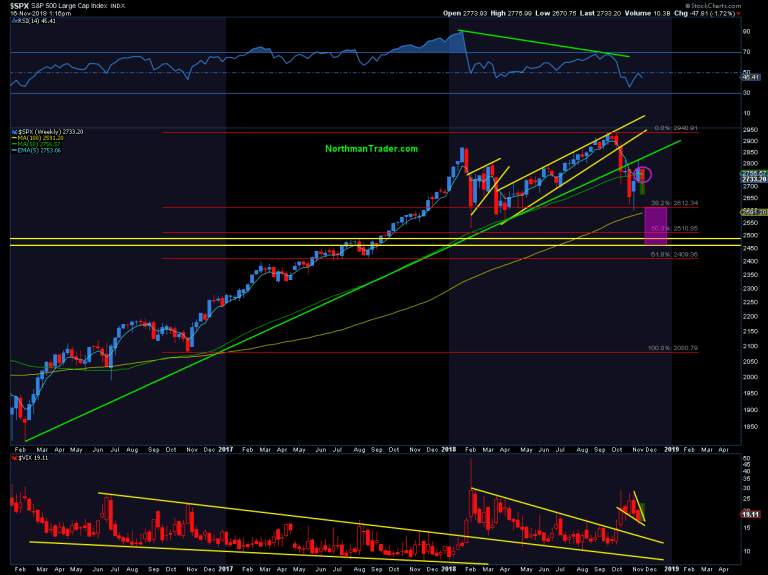 AAPL, NVDA, WMT, KMT, GE, GS, AMZN, FB…. I could go on, but all are individual stocks that are already facing major confidence tests, outright crises in some cases. I can’t predict the event, the timing, nor its reaction and hence I can’t base a trade outlook on it. Indeed nothing may happen. Our trade strategies are technical based. But event risk is out there and perhaps more imminently than any of us can know. But if an event on that front does happen technicals inform us ahead of time as to key risk and support levels which we can then use in deciding where and when to react. As the Watergate chart shows: Even during such events markets don’t move in just one direction.